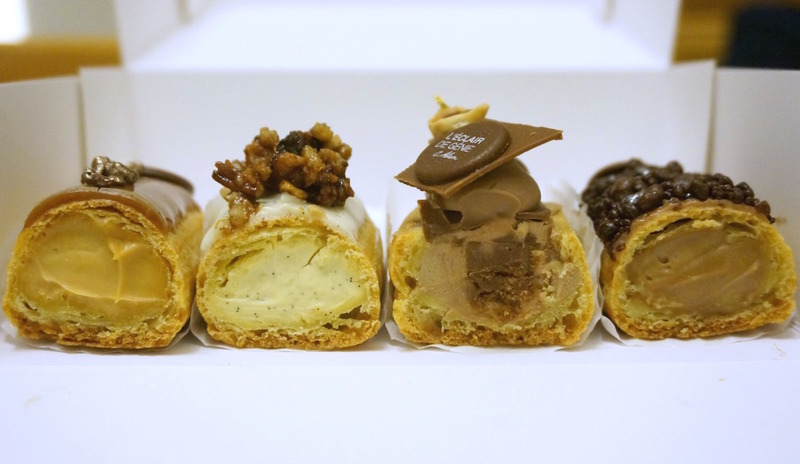 On arriving at the L’Éclair De Génie shop in Admiralty’s Pacific Place (the other location is in Central at Prince’s Building) and seeing a rainbow of éclairs licking their lips and blowing kisses my way, I have to admit sugar lust took over. The first éclair I looked at was $38, so I promptly started choosing my choux like a kid in a candy store (well, give or take a couple years, this is pretty much exactly what I was!). 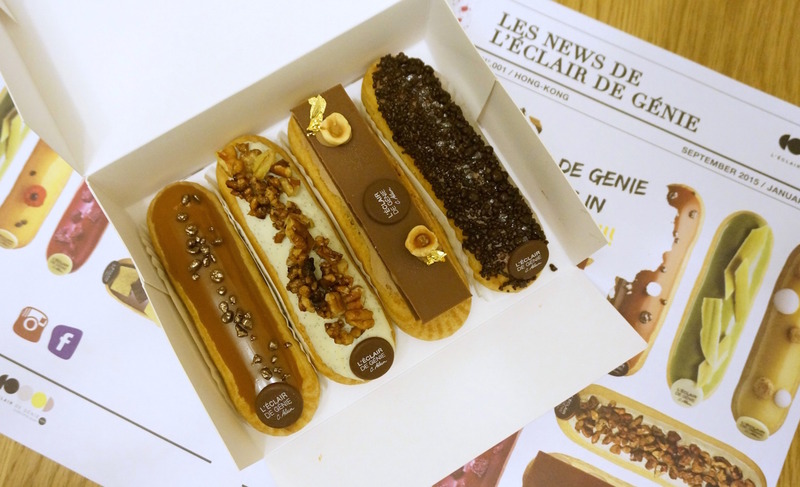 Having chosen four different éclairs, I went to pay – whereupon the total cost was revealed to be $183! Only on examining my receipt did I realise that all the éclairs were in fact priced differently, with one costing a whopping $55. That’s £5 for mostly air and cream, which is slightly terrifying… but not as terrifying as the fact that I’ve been so conditioned by Hong Kong prices, I paid it without even blinking. Anyway the proof is in the pudding – quite literally in this case – so I set to work tasting my bounty, which I’ve evaluated in ascending order of deliciousness because who isn’t a sucker for rankings? As you can see, I was thinking solely of my own satisfaction rather than the camera’s, resulting in all my éclairs being in varying shades of brown because… chocolate. First up, Vanille Pecan featuring Madagascar vanilla cream and caramelised pecan nuts. This was the most vanilla of the four, in the metaphorical sense as well as the literal; nice enough but immediately forgettable, like a mild acquaintance you keep meeting at parties but whose name you never quite remember. The caramelised nuts were good though. Next, Chocolat Pétillant, featuring Jivaro milky chocolate cream topped with sparkling sugar. This was nice if again, not especially exciting; the chocolate cream was done well, smooth and not too sweet, whilst the “sparkling sugar” is essentially pretentious patisserie speak for popping candy – a fun touch that also added an extra dimension. The flavour of Caramel Beurre Salé – salted butter caramel mascarpone cream – was spot on. Indulgent, sock-it-to-em salted caramel with that almost burnt intensity to it… my feelings about a good salted caramel dessert are well known, so feel free to insert a “Yasss queen” GIF here at your own leisure. 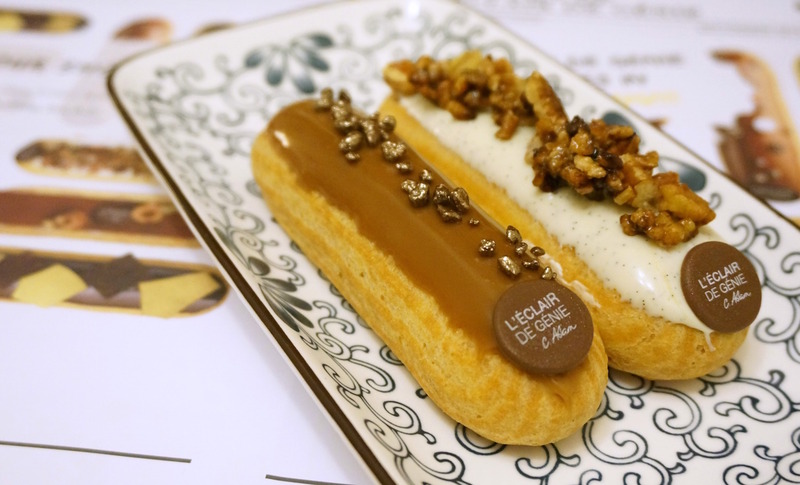 In an ever-so-slight vindication for the outrageous cost, my favourite éclair did turn out to be the most expensive one – Praline Chocolat Au Lait, featuring Bahibe chocolate ganache, feuillete praline, think chocolate leaf and roasted hazelnuts. I’ve talked before about how chocolate and nuts is one of my most loved dessert combinations and so it came to pass here; the core of nutty praline running through the centre, combining with the shattering of those thin chocolate sheets and smooth, velvety ganache was absolutely divine. But was it worth $55? Not so much… and for that, you could afford an extra hazelnut on top, no? Don’t you know the rules of three, L’Éclair De Génie?! 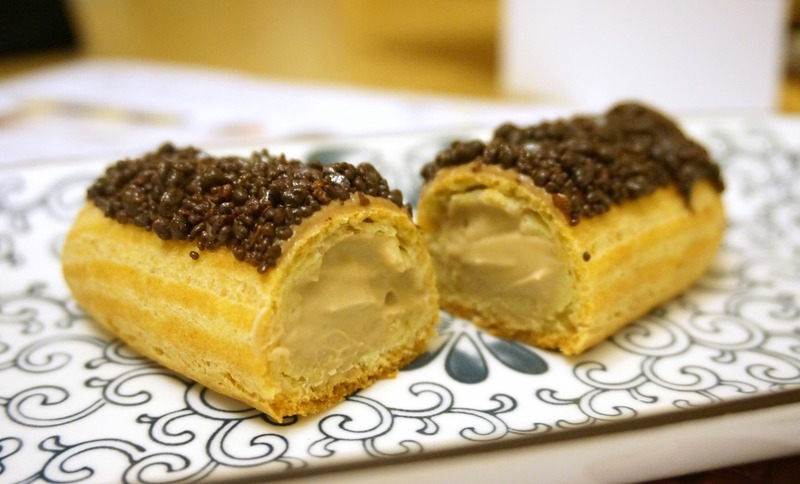 Overall though, my biggest criticism of L’Éclair De Génie’s éclairs is the choux pastry itself – it just wasn’t light enough. It has that heavy, slightly soggy feel of choux that has been refrigerated for too long; from what I understand, given the pastries aren’t piped on-site, that’s probably actually the case. Great choux leaves me with the sensation of, “Wait, where did that go… I ate it already? !” but these were definitely on the stodgier side. 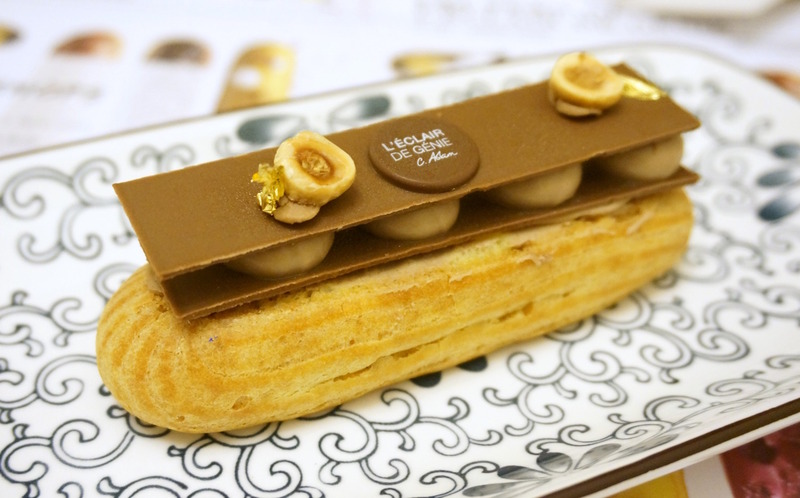 Given that éclairs are the current flavour of the month, I personally prefer those at Artisan Room and The Langham Hong Kong – and they’re slighter cheaper than the L’Éclair De Génie average of $45 too ($42 and $36 respectively). 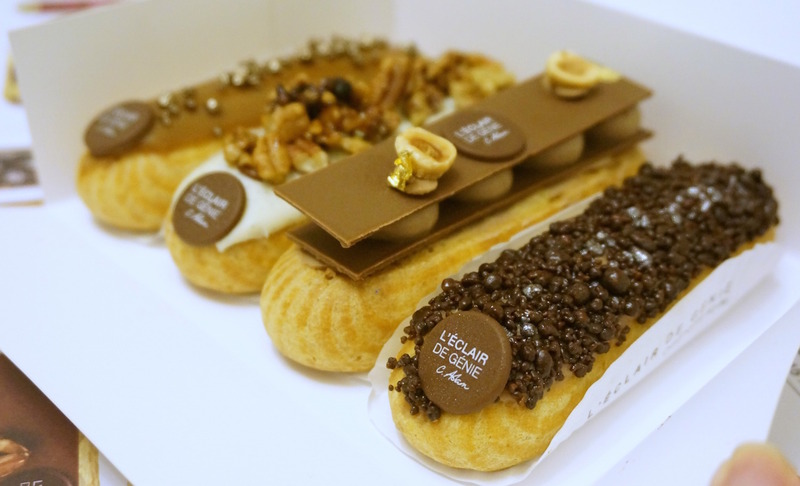 Although in the latter’s defence, their éclairs are a little chunkier than most and when they get the fillings spot on – as is the case with the salted caramel and chocolate praline – I’d say you almost forget about the slightly soggy choux. That being said, I’ll probably be spending my three wishes elsewhere in future… well unless someone else is buying, in which case it’s four Praline Chocolat Au Laits please! 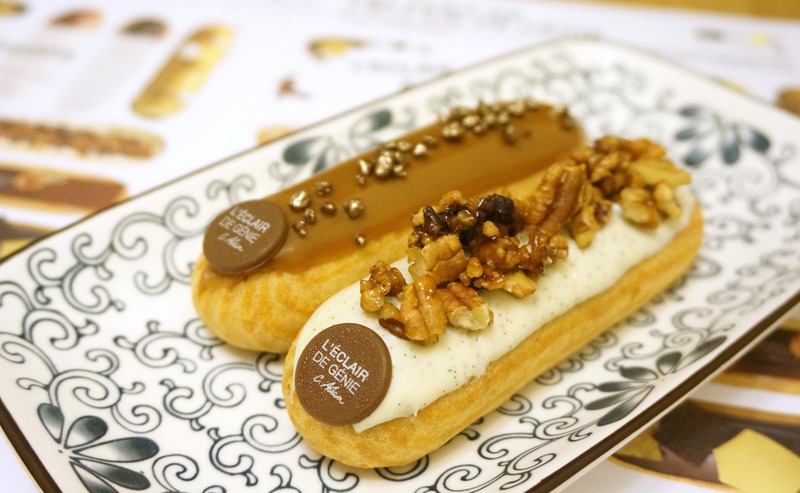 This entry was posted in Food and tagged best desserts in Hong Kong, best eclairs in Hong Kong, cafe Admiralty, cafe Central, Caramel Beurre Salé, chocolate, chocolate eclair, chocolate praline, Christophe Adam, desserts Admiralty, desserts Central, eclairs, eclairs Hong Kong, L'Eclair De Genie, L’Éclair De Génie HK, L’Éclair De Génie Hong Kong, Pacific Place, Prince's Building, review, salted caramel, salted caramel eclair, where to buy eclairs in Hong Kong. Bookmark the permalink. I’m so glad I found your review – I have seen the popup store many times now (the one in PP), and I am so tempted to buy some eclairs, but the prices are just ridiculous. I know, it’s PP and I need to support the high rents, but then isn’t it only pastry, cream and some flavour? Plus, the fact that they are sitting there in a refrigerator just spoils it for me – you are right, they should be made freshly, and served straight away! Afternoon tea it is then!